Physician-recommended for Mg Glycinate formulation. Safe and effective. Take before bed to help relax muscles and stop clenching teeth at night. I am finding this helps tremendously in taking it at bedtime to help me sleep better at night. Product wasn't as described. Contents are listed as a "magnesium glycinate blend", the first ingredient of which is "magnesium oxide", the cheapest and least bioavailable type. If you are looking for magnesium oxide, you can get it cheaper elsewhere. I am returning this item. This Magnesium is working wonders to eliminate my leg cramps..highly recommend this product. 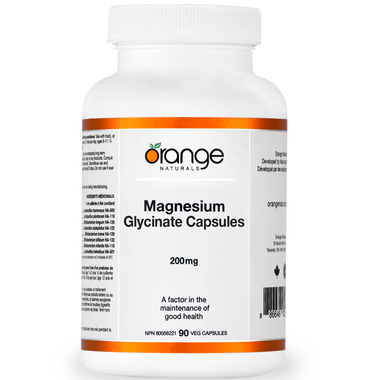 Best way to get magnesium something that is necessary for diabetics. The cost is reasonable and as a bottle lasts several months. Great product! I love the dosage and price. The main determinant of me purchasing this product was the dosage. I have never bought from Orange before, but I will definitely continue to. Effective and easy on the system. The best form of magnesium to take. so far so good, I only started a couple of weeks ago, and I am building up the dose. I seem to tolerate well. Excellent price, I buy this brand always.